Bought yourself a HomePod yet? Amidst talk that sales aren't doing too well, we've heard rumors about a cheaper version hitting the market, and today there's some extra information about that cut-price HomePod – it's going to come with Beats branding. The new report comes from Sina in Asia (via 9to5Mac) and should be taken with a pinch of salt for the time being. 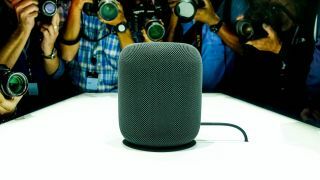 It's certainly plausible that Apple would restyle its cheaper HomePod in this way, though it might cause a little confusion for prospective buyers. As for the cheaper HomePod more generally, the leaked information matches up with what we've already heard. The price has apparently been set at $199 (about £150), which is some way south of the $349/$319 you'll have to pay to get one of the premium HomePods. Siri could well be cut from the device in an attempt to save some money and differentiate the less expensive speaker from the more expensive one. Presumably the audio quality won't be quite as mind-blowing either – Apple must be making savings on the hardware components somewhere. Various tipsters have said the lower-cost HomePod is scheduled to launch before the end of the year, so we shouldn't have too long to wait. It might show up at WWDC 2018 in June or perhaps at the September event Apple will hold to launch the iPhone XI.